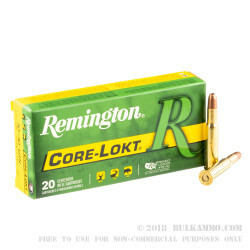 Billed as “the deadliest mushroom in the woods for more than 75 years,” the Core-Lokt is the original controlled expansion bullet and has been heavily favored by hunters since its introduction in 1939. 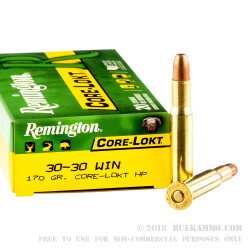 This 30-30 Win cartridge by Remington features a 170 grain projectile with the manufacturer’s proprietary Core-Lokt technology. The bullet’s solid lead core is fitted with a tapered copper jacket, which holds everything together on impact to deliver double the bullet’s size via expansion all while retaining its weight, providing consistent results while you are in pursuit of game. In addition to its Core-Lokt design, this round’s bullet is a hollow point, even further inclining it to cause massive terminal damage within a target. 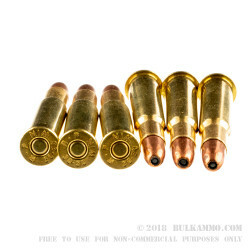 This cartridge also offers a pristine factory fresh brass casing with a non-corrosive Boxer primer. 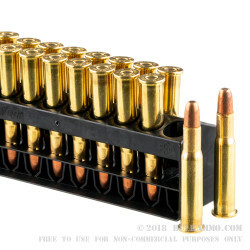 That means that 200 of these rounds would keep a handloading enthusiast well-supplied throughout multiple hunting seasons. This purchase ought to keep your chest freezer heavy for quite a while!